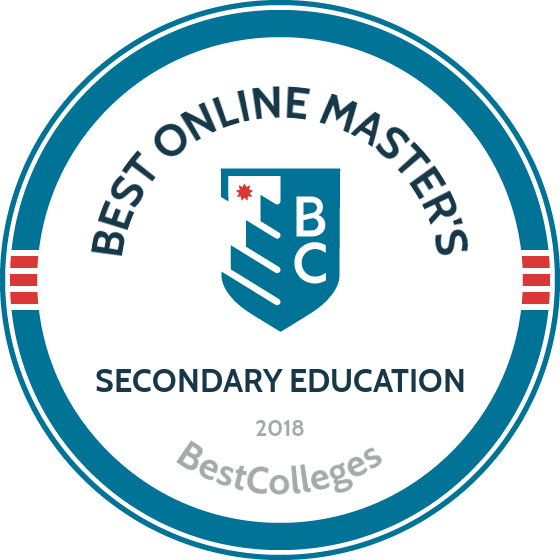 WHAT ARE THE BEST ONLINE MASTER'S IN SECONDARY EDUCATION PROGRAMS? What Else can I Expect from an Online Master's in Secondary Education Program? Now is a great time to pursue your online master's in secondary education. High school teachers have a projected job growth rate of 6% over the next decade. With class sizes growing larger each year, secondary teachers are in demand. The field of education incorporates the latest technologies in curriculum development, and you have the opportunity of being at the forefront of the evolving academic landscape. The following information introduces the field of secondary education and provides information on what to expect from the best online master's in secondary education programs. An online master's in secondary education will help advance your career in several ways. A graduate degree provides you with the knowledge and expertise to work with students in a variety of capacities, including career opportunities in teaching, curriculum development, and administration. Acquiring advanced skills in teaching subjects such as chemistry or English literature increase your marketability. Learning to teach ESL learners and special needs students allows you to fill critical roles in the educational system. Some programs require applicants to hold a valid teaching license, particularly programs that offer endorsements or specialized training in curriculum planning or special education. An online degree in secondary education does not usually require prior work experience. Students who hold bachelor's degrees in disciplines other than education often enter their master's program without prior teaching experience. WHAT ARE THE ADVANTAGES TO EARNING MY SECONDARY EDUCATION DEGREE ONLINE? An online degree in secondary education can provide working students the flexibility they need to maintain employment. It allows learners to complete assignments at their own convenience. Online learning is often self-paced. Other benefits include direct access to course assignments and materials, professional networking opportunities, and online peer support. NC State offers a partially online secondary education degree that prepares candidates to teach high school math. This degree covers educational theory and practical teaching methods through a combination of online and on-campus classes. Students in this program earn 33 credits to complete a master of arts in teaching degree with a concentration in secondary mathematics. Degree candidates take educational theory classes in assessment, classroom diversity, classroom research, and special education. Math education core courses discuss math in high schools and the use of educational technology in math education. Students pick elective classes in geometry, statistics, or interactions in math instruction. Future educators also participate in internships to gain experience practicing new skills in real high school classroom settings. Students can complete this accelerated teacher licensure program through 18 months of full-time study. Online classes in this hybrid program utilize synchronous and asynchronous formats. Prospective students must submit college transcripts and GRE scores. UNC Charlotte offers a master’s in secondary education online program for students who completed the university’s graduate certificate in middle and secondary education. This degree allows working teachers to attain advanced teaching licensure. UNC Charlotte's master of arts in teaching in middle and secondary education program requires candidates to complete 21 credits, in addition to the 18 credits needed for the certificate program. Students who already hold the certificate can complete this degree in one year of full-time study. Students take educational theory classes in adolescence and learning, research methods, and teacher leadership. Distance learners may choose a concentration in teaching methods in English, math, science, or social science. During the final capstone course, teacher candidates compile portfolios of their work. Online classes are asynchronous. This program accepts working teachers who earned the university’s middle school and secondary education certificate program. Applicants should have maintained a GPA of 3.5 or better in the certificate program. Candidates supply letters of recommendation from instructors who taught them in the certificate phase of the program. Prospective students must also submit a statement of purpose. Located in Los Angeles, USC offers a secondary education degree online that helps candidates develop as effective teachers. This course of study gives candidates broad knowledge of current topics shaping secondary education. The master of arts in teaching with a concentration in single subject teaching (secondary) program at USC requires candidates to earn 28 credits. Full-time students can complete this degree in one year. Classes explore pedagogy in urban schools, educational equality, language development, and student differences. Candidates focus on subject-specific issues in English, math, science, or social science. The program uses field experiences to demonstrate how expert teachers apply learning theories in real classrooms. Online classes include asynchronous and synchronous delivery elements. Prospective students must hold a bachelor’s degree from an accredited institution. The program normally accepts candidates with GPAs of 3.0 or better. Applicants must submit college transcripts, statements of purpose, resumes, and letters of recommendation. SDSU's master of arts in teaching program uses current research to help candidates understand broad educational issues. The program encourages students to think critically about instructional methods and curriculum. Students examine the role of Common Core standards in shaping the future of primary and secondary education in the United States. Asynchronous online courses allow teacher candidates to continue working while pursuing the degree. This online master's in secondary education degree requires students to earn 24 credits. Secondary education core classes explore curriculum development, ways to assess student achievement, emerging practices in teaching linguistically and culturally diverse students, and proven strategies for implementing research-based pedagogy in high school settings. Candidates apply learned knowledge to researching current educational topics in capstone courses. Students can complete this program in one year of full-time study. Prospective students should submit college transcripts and letters of recommendation from professional or academic references. Most students also supply GRE scores. Founded in 1892 and affiliated with the Southern Baptist Convention, WCU states that its vision is "to build a community of learners seeking to blend faith and learning with living.” The university delivers a master's in secondary education online in an asynchronous format through the Canvas Learning Management System (LMS). In this program, students are required to complete weekly assignments, research, reading, and participate in discussions with their classmates. WCU assigns each of its graduate students an academic advisor. WCU's master's of secondary education is a 30-credit online degree that students typically complete in five trimesters, or 15 months. Benefiting from small class sizes, distance learners receive instruction on the latest technology, research, and best practices to maximize educational opportunities for middle and high school students. To earn their master's degree in secondary education, students must also create portfolios for use in their own classrooms. Offering more than 70 degrees through distance learning programs, UA features online courses taught by the same faculty as its on-campus classes. The university delivers an online secondary education degree in the form of a 30-credit master's of arts in secondary education - English language arts. Applicants must have a minimum score of 300 on the revised GRE or 50th percentile on the MAT exam, at least 3.0 GPA for their undergraduate degree or graduate work, and hold a bachelor's-level teaching certificate in secondary education English language arts. UA accepts program applications throughout the year. In UA's online secondary education program, students learn how to develop classroom environments in ways that engage students, how to design and implement curricula, and how to assess students effectively. Required courses include modern secondary school programs and computer-based instructional technologies. In addition to their coursework, students must also complete 15 credits teaching in the field, six credits of electives, and pass a comprehensive written exam to earn their degree. Established as a land-grant institution in 1878, MSU is known as "The People's University." The top research university in Mississippi, the school uses 4,200 acres of farms and woodlands for agricultural research. MSU delivers online degrees in secondary education, typically requiring students to complete 33 credits and pass a comprehensive written exam to graduate. Courses cover topics like improving instruction and issues of accountability. Students may choose a K-12 or 7-12 grade concentration in a variety of subject areas, such as biology, reading, and social studies. To apply for MSU's online master's of science in secondary education, students must either hold a teaching license or provide evidence of eligibility for licensure. Students may choose to do some coursework on campus, but can complete the degree entirely online. The faculty for the online program is the same as on campus. Additionally, students have access to a faculty advisor and online tutoring. MSU utilizes the myCourses online LMS. Program graduates may be eligible for the Class AA Mississippi Educator License. UNM, based in Albuquerque, offers an online master’s in secondary education that emphasizes teacher leadership skills. This degree prepares expert classroom instructors able to serve the needs of diverse student populations. Candidates complete this degree through online classes delivered in asynchronous format. The program operates on a cohort system, and students may occasionally interact with peers at specific times. UNM's master of arts in secondary education program requires candidates to earn 32 credits. Students can complete the degree through two years of full-time study. Teaching theory classes cover instructional strategies, curriculum development, and effective teaching and student learning. Leadership classes discuss social justice in education, mentoring educators for professional growth, and educational leadership in a democratic society. Prospective students submit college transcripts demonstrating a GPA of at least 3.0 in the final 60 credits of undergraduate study. Candidates must also hold valid teaching licenses. Students should send letters of intent, resumes, and letters of recommendation. Located in Chicago, Illinois, DePaul offers master’s degree programs that focus on high school education. The programs demonstrate engaging teaching techniques that motivate students to learn. DePaul offers two online degrees in secondary education with similar courses of study: a master of education or a master of arts in secondary education. The M.Ed program requires candidates to earn 60 credits, normally through two years of full-time study. Students conduct research and write thesis papers in their final year. All students in this program take classes in human development, curriculum instruction, sociology of education, and philosophy of education. Candidates then choose from subjects such as biology, chemistry, English, environmental science, history, mathematics, physics, social science, or visual art. Online courses are delivered in asynchronous format. Applicants should submit college transcripts, resumes, and letters of recommendation from academic or professional references. For more than 160 years, SJU has provided Jesuit-based education at its main campus in Philadelphia, Pennsylvania. SJU also delivers degrees online, including a master's of science in secondary education (grades 7-12). Coursework covers subjects like adolescent psychology, language and culture, and diagnostic assessment. Throughout the program, students learn how to design curriculum, teach students with different learning styles, evaluate achievement, and use specific skills to assist special needs and ESOL students. SJU's online secondary education degree requires students to complete 36 credits, including five semesters of coursework and one semester of student teaching at a private, public, or international school of the student's choice. The university offers its online courses in an asynchronous format, and students communicate with each other and faculty through email and online discussion forums. SJU assigns each student a personal student services coordinator to assist with academic planning and to ensure they fulfill degree requirements. Program applications require a background check, and PA residents must complete the PA Criminal History Record and PA Child Abuse Clearance. Graduates are qualified to apply for secondary education certification in PA, which is valid in most U.S. states. Brandman, based in Irvine, California, delivers a master of arts in teaching degree that prepares candidates for rewarding secondary education jobs. Degree candidates learn to develop curricula, provide differential instruction, and manage classrooms. Emerging teachers complete coursework for this degree through online classes delivered in asynchronous format. Brandman's master of arts in teaching, secondary education with single subject credential requires 49 credits. All learners take introductory classes that cover the art and science of teaching for inclusive schooling. Core classes explore teaching English learners, classroom diversity, and educational research. Candidates also choose specific subject focuses. Student teaching practicums allow degree candidates to apply cutting-edge educational theories in real classrooms. Prospective students must have a bachelor’s degree from a regionally accredited institution. The program normally accepts applicants with GPAs of 2.75 or better. Candidates with GPAs below 2.75 may gain admission with competitive GRE scores. UNK coordinates a master’s in secondary education online program that integrates technology and research-based instructional techniques. Students in this course of study learn curriculum development and teaching skills relevant to high school contexts. UNK's master of arts in education in curriculum and instruction program requires students to earn 36 credits. All degree candidates take classes in educational theory that cover research, philosophy of education, multicultural education, and educational technology. Students in the secondary education concentration take classes that explore multiple intelligences, teacher effectiveness, strategies for students with disabilities, and reading. Learners also choose classes in specific subject areas such as English, math, or science. Candidates complete thesis papers about educational research topics. Degree candidates must pass exit exams and participate in surveys of desired outcomes. Students complete this program through online classes delivered in asynchronous format. Applicants must submit undergraduate transcripts proving a competitive GPA. Most students also supply GRE scores. Experienced teachers may submit professional biographies in place of GRE scores. Muncie, Indiana is home to Ball State University, which offers 145 fully online graduate programs, including more than 40 degrees in education. Ball State features an online master's of arts in secondary education, taught by on-campus faculty, where students receive the same advising, academic, technological, and career-planning support as on-campus students. This master's in secondary education online is designed for current middle and high school teachers, and is intended to improve the effectiveness of instruction through the creative application of theory. The 30-credit program's coursework covers six core areas: curriculum, pedagogy, educational foundations, educational technology, multicultural education, and educational research. Students must also complete four electives within the six core areas. Out-of-state distance learners pay a higher tuition rate than in-state students. Ball State offers financial aid, including loans, to online graduate students. Applicants should check the state authorization list to ensure they are eligible for the program; most U.S. states are authorized or are in the authorization process. Students should also look at individual state licensing requirements. Texas State offers six secondary education programs online. Students select courses of study that match their career goals. These programs result in master of education or master of arts in education degrees in secondary education. The M.Ed secondary education with teacher certification requires 36 credits and prepares candidates for high school teaching roles. The M.Ed in secondary education, also a 36-credit program, helps teachers transition to school leadership or research roles. The M.Ed secondary education dual credit concentration, a 39-credit program, trains candidates to teach dual-credit subject courses at the secondary level. The 39-credit educational technology M.Ed program trains specialists to use technology in classrooms and libraries. The M.Ed talent development program, requiring 36 credits, prepares instructors to work with exceptional students in school and non-school settings. The 30-credit MA in secondary education programs prepares candidates to go on to doctoral programs. Prospective students must submit undergraduate transcripts. M.Ed applicants should have a GPA of 2.75 or higher in their final 60 undergraduate credits. The MA program normally requires students to have a GPA of 3.4 or higher in their last 60 credits of undergraduate study. UNI, located in Cedar Falls, offers a secondary education degree online that has two goals: to deepen knowledge of math concepts and to promote research-based instructional methods. This program combines online and in-person learning. During fall and spring semesters, students study entirely online. Summer semester classes require candidates to come to campus for two weeks, then study online. This program emphasizes cohort-based learning, and encourages candidates to complete classes in the prescribed order to keep up with their peers. Candidates seeking this master of arts in mathematics degree with an emphasis in secondary teaching must earn 32 credits. Students usually complete the program in seven semesters of full-time study. Math classes cover new developments in math education, algebra, geometry, statistics, and calculus. Education classes consider student equity, cognitive demand, assessments, and educational research pertaining to mathematics instruction in secondary classrooms. Candidates with GPAs of 3.0 or better qualify for full admission. Applicants with GPAs of 2.75 or higher may gain provisional admission. Known as "Georgia's large-scale, small-feel research university," GSU is a Carnegie doctoral and research institution. Located in Statesboro on a 900-acre campus, the school features a planetarium, Center for Wildlife Education, and Garden of the Coastal Plain. GSU programs include an master's in secondary education online, designed for those holding a Professional Level Four Certificate (or equivalent) in: biology, broad fields science, business, chemistry, economics, English, geography, history, mathematics, physics, or political science. The program is not suited for students who are pursuing initial certification or who hold a nonrenewable certification. GSU's online secondary education degree integrates research throughout the coursework. Students must complete six credits of a professional education core, 12 credits in their area of concentration, 12 credits of specific requirements, and six credits of electives. The program has three admissions deadlines per year. Prospective students should confirm that the program is accredited in their state prior to applying. UH Manoa offers a partially online secondary education degree for candidates with undergraduate backgrounds in subjects other than education. Students in this program earn initial teaching licensure. This degree emphasizes field experiences and connects candidates with mentor teachers. The program follows a cohort format, where learners interact with their peers to reach educational goals. Students must occasionally attend class on campus. Students in UH Manoa's master of education in teaching program complete 45 credits. The program usually takes two years of full-time study. Students focusing on secondary education learn research methods and secondary-level teaching techniques. Candidates participate in teaching internships and complete research papers or projects. Applicants must send all transcripts from accredited colleges. The program normally accepts candidates with GPAs of 3.0 or better. Prospective students with GPAs of at least 2.7 may gain admission if there is space in the cohort. SAU’s online master’s in secondary education prepares candidates with undergraduate degrees in subjects other than education to work as high-functioning teachers. Candidates practice research, communication, and instructional skills needed to teach in high school settings. Asynchronous classes allow students to watch lectures and engage with peers on their own schedule. Students seeking this master of arts in teaching degree must earn 30 credits to graduate. Classes cover foundational topics in education such as learning theories, assessments, classroom management, and exceptional individuals. Candidates pursuing the secondary education concentration focus on specific subject areas such as art, English, math, social studies, science, or physical education. All degree candidates complete supervised teaching experiences. The program normally takes two years of full-time study to complete. The program normally accepts candidates with a GPA of 3.0 or better. Applicants must supply scores from GRE or Praxis exams. UWA was founded in 1835 as a teacher's college. Today, the university serves nearly 3,000 online students and offers a master's in secondary education online. Applicants for this program must hold a bachelor's-level Professional Educator Certificate and pass a background check. UWA's online master's of high school education (grades 6-12) consists of 34 credits: 19 credits of professional courses like foundations of education and educational planning, and 15 credits of teaching field courses in the student's area of study. Students may need to complete an online survey course in special education, depending on previously completed coursework. Those who are seeking certification in English language arts and history must fulfill additional requirements. Program courses are accelerated, and most students complete the program in 18 months. UWA does not offer any scholarships at the graduate level, but students may seek other forms of financial aid. The secondary education degree online program at UAH focuses on advanced teaching skills. This program trains educators to maximize learning opportunities for all students in high school classrooms. The master of education with secondary education concentration requires 33 credits. Students can complete the program in 18 months of full-time study. Online classes incorporate synchronous and asynchronous elements. Education courses explore multiculturalism, educational research, cognitive psychology, and differentiated instruction. Concentration classes cover issues relevant to secondary education such as curriculum and instruction, project based learning, and educational technology. Students in this program choose specific subject focuses in biology, chemistry, English, English as a second language, history, math, or physics. All degree candidates complete summative action research projects. Prospective students must supply undergraduate transcripts. Applicants should have a GPA of 3.0 or better. Potential students must also submit GRE or MAT scores unless they have three or more years of professional teaching experience. Located 100 miles from Atlanta in Columbus, Georgia, CSU is home to the Oxbow Meadows Environmental Learning Center and the Coca-Cola Space Science Center. CSU's degree programs include a master's in secondary education online, which consists of 39 credits. Designed for those changing careers with backgrounds in mathematics, science, technology, and related fields, CSU's master's of arts in teaching secondary math and science requires a minimum 3.0 GPA in all graduate coursework. This program allows students to transfer up to nine credits toward their degree. Admission is only in the fall semester, and applicants must pass an FBI background check. Program graduates can pursue certification in math, biology, chemistry, physics, and earth/space science for grades 6-12. Graduates will be recommended for certification by the Georgia Professional Standards Commission if they pass the Georgia Assessments for the Certification of Educators exams and the edTPA assessment. The latter is completed during the nine-credit student-teaching/internship portion of the program. The online secondary education degree at UNT provides a way for students with undergraduate degrees in subjects other than education to gain initial teacher certification. The master of education in teaching with a major in secondary education certification program at UNT requires candidates to earn 36 credits. Core classes cover applied theory, curriculum for culturally diverse learners, classroom discipline, and literacy. Candidates in the secondary education track participate in student teaching practicums to gain experience in real classrooms. Asynchronous online classes allow busy professionals to study whenever their schedules permit. Prospective students must submit undergraduate transcripts and GRE scores. The program normally accepts applicants with a GPA of at least 2.88 in their final 60 credits of undergraduate study. Candidates also send an essay summarizing their teaching philosophies, a letter of intent describing how this program fits their career goals, and a current resume. Founded in 1963, Georgia's KSU serves nearly 3,000 graduate students. The university delivers secondary education programs online, including a master's in secondary education. This program is suited for teachers already certified in middle (6-8) or secondary grades (6-12) in English, history, mathematics, or science, and is designed to prepare students to become "teacher-leaders." Students must select a concentration in English, history, mathematics, or science for certification. If distance learners enroll in endorsement courses, all coursework is available entirely online with the exceptions of the history and science concentrations, which are only available in a hybrid format. KSU uses the Desire2Learn Brightspace LMS. The online master's in secondary education's 36-credit curriculum includes a core, endorsement certification courses or electives, and 12-18 credits of teaching field courses. New cohorts begin in the summer semester. Students may complete the program within four semesters, but KSU recommends five or six to balance full-time teacher schedules. Lynchburg, Virginia's LU was founded in 1971 by the Baptist evangelist, Dr. Jerry Falwell. The largest Christian university in the world, the school is home to approximately 15,000 residential students on its 7,000 acre campus. LU also provides instruction to more than 94,000 online students, boasting a 17 to 1 student-to-faculty ratio in its distance learning programs. The university delivers 166 online graduate programs, including a master's of arts in teaching with a specialization in secondary education. This 36-credit program is designed for students who lack teaching experience but are pursuing an initial license in secondary education. LU allows graduate students to transfer up to 12 credits towards their degree. Students may also earn credit for professional training and life experience. Coursework for LU's online master's in secondary education includes core subjects in addition to curriculum development and behavior management classes. Students must also complete three on-campus intensives and three credits of student teaching. Graduates will earn verification of completion of Virginia's state-approved secondary education licensure program, but should review their own state's regulations to determine if additional requirements apply. UNCW offers a master’s in secondary education online program that helps teachers prepare for educational leadership roles. Students in this program gain critical skills in curriculum design and content preparation. Candidates complete this degree through online classes that incorporate asynchronous and synchronous elements. The program follows a cohort model and encourages students to collaborate with peers throughout the course of study. The master of arts in teaching in secondary education program at UNCW requires candidates to earn 33 credits. The online cohort track takes two years to complete. Students complete core classes in student diversity, educational technology, and secondary school organization. Students choose classes in subject specializations such as English, history, math, or science. All students in this program participate in field experiences and internships in secondary schools to apply learned skills. Prospective students should hold a GPA of 3.0 or better. Candidates should also send GRE or MAT scores. Applicants with extensive professional experience may apply to waive the test score requirement. The following concentrations are commonly offered by secondary education programs. While the details may vary from program to program, this table outlines the typical learning outcomes of these areas. Choosing a concentration in secondary education allows you to develop specialized skills and work with different types of students with varying needs. Educational Leadership Educational leadership students learn how to manage learning environments, implement evidence-based instructional strategies, and communicate with stakeholders. Focal areas include ethical leadership development and decision making skills in a diverse, community-oriented context. Students are prepared for roles as assistant school principals, school principals, college instructors, and instructional supervisors. English as a Second Language (ESL) Students learn teaching strategies for ESL learners. This concentration focuses on the psychology of learning English, and students become familiar with cognitive processes that influence language development and literacy instruction for ESL learners. This concentration prepares student for careers as ESL teachers at middle and high schools. Other career possibilities include assessment and consultation. Special Education This concentration prepares you to work with children who have disabilities and other at-risk youth. The curriculum emphasizes teaching strategies to accommodate a variety of special learning needs and examines policies that impact special education. Students learn how to promote positive behaviors, develop IEPs, and advocate for children's educational rights. This concentration prepares students for careers teaching children and adolescents with special learning needs. While the curriculum may vary depending on the program, most online master's in secondary education programs include the following courses. These courses emphasize teaching strategies geared toward middle and high school students and focus on contemporary trends in teaching. Curriculum Development: This course provides training in curriculum design and instruction. Students learn how to create engaging learning environments that reach students across cognitive levels. Best-practice instructional strategies guide curriculum decisions, and students gain skills in age-appropriate methods of teaching secondary education. Students learn how to plan lessons that require active participation. Adolescent Psychology: This course prepares students to teach secondary education by familiarizing them with theories of adolescent development that emphasize learning, cognition, and social development. It explores motivational learning strategies and approaches to classroom management, introduces students to assessment techniques, and focuses on creating learning opportunities that meet individual needs and motivation levels. Foundations in Secondary Education: This course provides students with an overview of the historical and contemporary issues in education. It focuses on current trends and policies that affect educational systems. Students explore how to establish inclusive learning environments in a multicultural society. Students interested in teaching, consulting, and pursuing leadership roles in education benefit from this course. HOW LONG DOES IT TAKE TO GET AN ONLINE MASTER'S IN SECONDARY EDUCATION? Most online master's in secondary education students earn their degree in two years. The average program consists of 36 credits. Full-time students have the ability to earn their degree in a year, while part-time students often take up to three years. Factors that influence the length of the program include concentration and student teaching requirements, the student's prior teaching experience, and initial licensure requirements. Students complete their online degree in secondary education at their own pace or with a cohort. Self-paced learning is a common feature of distance education, and it allows students to work independently to complete assignments. Most self-paced learning courses are delivered asynchronously, and students progress through the program at their convenience. Individually-paced programs usually admit students throughout the year. Cohort learning programs admit a select number of students, typically in the fall, spring, or summer. Learners form a community and pursue their degrees together. This format is similar to traditional program and emphasizes teamwork and peer support. Teacher Licensure: Some programs include initial licensure in the curriculum, and students complete the exam as part of their program. Teacher licensure varies by state, and students often have to take the Praxis exam as part of the certification process. Once licensed, teachers can pursue careers in public and private schools. Licensure must be renewed every few years. Instructional Leadership Licensure: Many states require an instructional leadership license for professionals who seek administrative careers in education. The process of earning this certification is similar to teacher licensure, and applicants must take the Praxis or a related exam to demonstrate knowledge in instructional leadership. Many states require school principals to hold this or a similar license. Accredited universities and colleges offer the best online master's in secondary education programs. These schools participate in peer review processes and are held accountable by their regional or national accrediting bodies. Regionally accredited universities are members of one of six accrediting bodies across the U.S. and adhere to the standards set forth by their region's accreditor. Nationally accredited schools usually offer vocational or distance learning programs and generally have lower tuition rates than regionally accredited institutions. Students pursuing advanced degrees may find that undergraduate credits earned from nationally accredited universities are not accepted by regionally accredited graduate programs. Many online programs are accredited by the DEAC, which requires accredited distance learning programs to adhere to the commission's standards and policies. The Council for the Accreditation of Educator Preparation (CAEP) accredits teacher training programs. CAEP ensures that education programs provide students with knowledge and skills comparable to national standards. The Department of Education (DOE) and the Council for Higher Education Accreditation (CHEA) play important roles in the standardization process of accrediting bodies. The DOE is a federal organization that recognizes accrediting bodies and sets the standards to which they and their programs adhere to. CHEA promotes academic quality through its accreditor recognition process. Accrediting bodies recognized by these organizations demonstrate accountability and participate in self studies and peer reviews to maintain academic quality. Students can access databases of all accredited schools in the U.S. whose accrediting bodies are recognized by CHEA and DOE. An online master's in secondary education prepares students for careers as teachers, educational administrators, support staff, and more. An advanced degree allows secondary teachers to focus on the instruction of a specific subject or to pursue leadership roles within the school system. Educators who hold a master's degree can teach undergraduate courses at community colleges and universities. Teaching careers require patience, resourcefulness, and communication skills. They work with parents and the community to promote students success. Successful principals are effective leaders who possess strong interpersonal skills. Listed below are examples of possible careers for graduates. High school teachers provide 9th-12th grade students with academic instruction. An advanced degree allows them to teach a single subject, such as science or math, or multiple subjects. High school teachers plan lessons, communicate with parents, and incorporate standardized testing preparation into their class curriculum. They are qualified for careers in public and private education. Secondary school special education teachers work with adolescents who have learning and developmental disabilities. They create IEPs and adapt lesson plans to meet the diverse needs of their students. Special education teachers help traditional classroom teachers accommodate students with disabilities and assist special-needs students in the transition to life after graduation. Secondary school principals work in middle schools and high schools. They design and implement the school's curriculum and monitor teacher and staff performance. They establish the school culture and manage student behavior. Instructional coordinators develop curriculums, analyze test data, and work with teachers to implement new learning techniques and strategies. They hold teacher training workshops and coach teachers to help improve their skills. Instructional coordinators recommend educational material, including textbooks and new technologies. A master's degree is required for a career as an instructional coordinator. Factors that influence annual earnings in secondary education include degree level, employer type, and work experience. Data retrieved from PayScale indicates that years on the job positively impact annual earnings. The following table demonstrates the relationship between professional experience and salary. Professional organizations provide students and recent graduates with valuable resources, including networking opportunities, access to job postings, and the latest in educational research. Many professional organizations offer teaching strategies and tools for developing lesson plans, communicating with parents, and motivating students. They often provide insurance and debt services to their members. Students who become members of professional organizations learn how to advocate for the profession and those they serve. AFT is a professional union that provides members with legal and financial services, student scholarships, and professional development opportunities. AAE offers liability insurance for practitioners, grants for classrooms, and professional resources. Student members have access to the organization's publications, such as the back-to-school resource guide. Student members of NEA have access to scholarships, articles, and resources for new teachers. The organization conducts professional workshops and conferences, which include topics on classroom management and pedagogy. The field of education is ripe with scholarship and funding opportunities, including grants for teachers earning their master's. The federal government offers a variety of financial aid options, and students must complete the FAFSA to determine what types of assistance they are eligible to receive. The Institute of International Education offers the Fulbright Distinguished Awards in Teaching Program that covers the cost of studying and teaching abroad. Other financial assistance programs include graduate assistantships and work-study programs.